Take the Tsukuba Express line to Banpaku Kinen Koen Station. Take a taxi from the station to the school (5.4km). Take the Joso line to Mitsuma Station. Take a taxi from the station to the school (4.1km). Please note that many car navigation systems will not have the school’s address registered. Please do not rely on (older) navigation systems to get to the school. If you use your cellphone as a navigation tool, put “Tsukuba International School” (rather than the address) into Google Maps. There is a long east-west running road that divides Tsukuba in half. This road is known locally as “Tsuchiura Gakuen-sen” or Route 123. Take this road west for several kilometers, past Tsukuba Center (where Tsukuba Station is), LaLa Garden (on the left), Starbucks (on the right), and Yamashin Gran Stage (on the right). Continue on this road for 5km past Yamashin Gran Stage. (You will pass Shuei High School on your right and keep going for several kilometers.) The road will become smaller, going from 6 lanes, to 4 lanes, and finally 2 lanes. You will see a European (Tudor-style) house on your left just after the road narrows to two lanes. There is a traffic light just after the European house. At the next traffic light after the one in front of the European house, turn left. (There are only fields around this traffic light.) 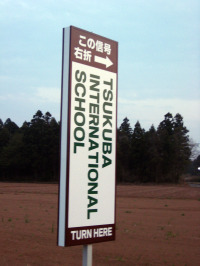 There is a sign at this intersection telling you to “turn here” for Tsukuba International School. Travel down this road for about 200 meters and you will see the school (a huge wooden building) on the left. Exit the Ken-oh Expressway at Tsukuba Chuo. At the intersection with the traffic signal turn right (north) onto Route 19 (Science Odori). Continue on this Route until you reach Route 123 (fourth intersection with a traffic light). Turn left onto Route 123. Continue on this road for 5km past Yamashin Gran Stage (on the right). (You will pass Shuei High School on your right and keep going for several kilometers.) The road will become smaller, going from 6 lanes, to 4 lanes, and finally 2 lanes. You will see a European (Tudor-style) house on your left just after the road narrows to two lanes. There is a traffic light just after the European house. At the next traffic light after the one in front of the European house, turn left. (There are only fields around this traffic light.) There is a sign at this intersection telling you to “turn here” for Tsukuba International School. Travel down this road for about 200 meters and you will see the school (a huge wooden building) on the left. Exit the Ken-oh Expressway at Joso (常総バイパス/国道294号線). Take the road on the right at the fork and merge onto Highway 294, travelling south. At the first intersection with a traffic signal (Misaka Shinden Nishi, 三坂新田西), turn left (east). At the third intersection with a traffic signal, turn right. Travel down this road for about 200 meters and you will see the school (a huge wooden building) on the left.